Bing's new look focuses on a left-hand navigation menu called the Explorer Pane. This extra column of content includes Quick Tabs that break searches down into Web Groups relevant to your search. For example, a search on "Nikon D70" triggers the Explorer Pane to create Quick Tabs for shopping, accessories, and videos all based on what your intent might be. Under Quick Tabs in the Explorer Pane are additional subcategories such as 'Related Searches' and 'Search History'; the latter, as its name implies, shows you recent searches. Microsoft asserts that 50 percent of all searches are repeats, and that providing a session history therefore offers a shortcut to results of redundant searches. My take: The Explorer Pane can be extremely useful, which may make the trade-off of cluttering up the search results page worthwhile. But in my initial tests, Quick Tabs often steered me to Microsoft services such as Bing Shopping, Bing Travel, MSN Autos, and Bing health information. It may be that those Bing sites offer the best content, but I get suspicious of any search engine that habitually gives its own links precedence over others'. 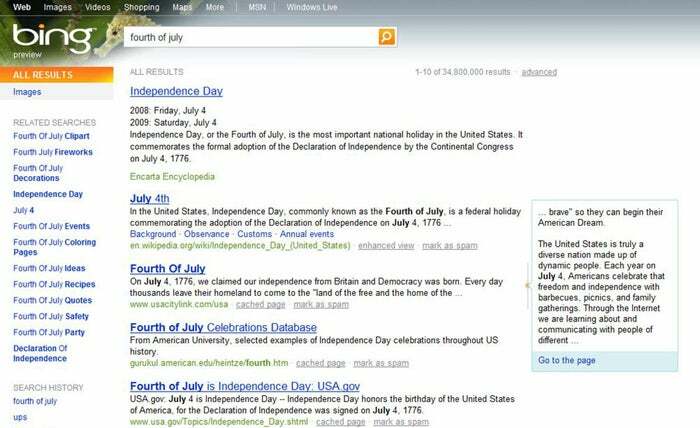 Bing distributes its search results into various search categories. For example, Bing divided the results of my search for "Saturn Vue" into the categories 'MSN Autos', 'general search results', 'problems', 'images', 'parts', 'repair', and 'specs'. My Take: Though a logical breakdown of categories within search results can be convenient, it does lead to a lot of scrolling down. I'm not sure that I want to scroll--and scroll some more--to find what I'm looking for. Furthermore, categorized search seems a bit redundant when you have the handy Explorer Pane to help you focus your search results by categories. 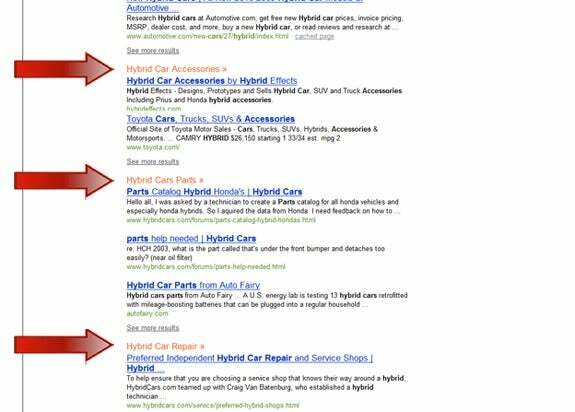 Bing joins Yahoo in declaring war against the "ten blue links" approach to reporting search results--Google's method of displaying lists of Web sites that might be what you're looking for. Bing takes a two-pronged approach to fighting "blue link" fatigue. First, its Quick Preview feature gives you a text-based synopsis of the pages displayed in your search results. I dragged my mouse cursor over individual search results for "Babe Ruth," and up popped a box of data pulled from the site. Bing also peppers search results with what Microsoft calls Instant Answers. As the name implies, Instant Answers serve up answers to questions such as currency conversion, weather forecasts, and movie times. My Take: I didn't like the Quick Preview feature because I found that it took too long for boxes to pop up with text. Sometimes, a Hover box would appear without text. In many cases when text did appear, it didn't give a strong enough clue as to whether the site was worth visiting. 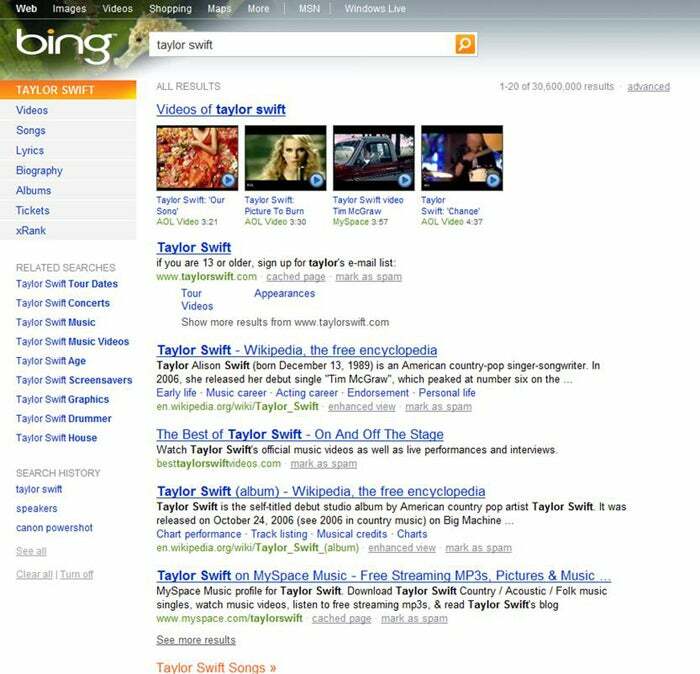 Given its shortcomings, this Bing feature may be the first to get axed by Microsoft.